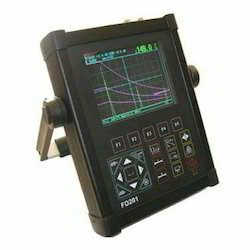 We are highly instrumental in manufacturing and supplying a huge range of Ultrasonic Flaw Detectors that are widely used to detect and distinguish several hidden internal defects in several engineering materials such as metals, plastics and composites that are for inspection various specification of performing test, and to take measurements. Serves as all the solution for various cleaning and flaw detecting purposes, this instrument, Flaw Detectors combines the highest level of performance for filed operation; it provides precise quantitative evaluations with the simplest of controls that can easily be handled. These models are powered by rechargeable batteries housed inside the main units. Moreover, a plug in battery charger permits the battery to be charges without removal from the main unit.